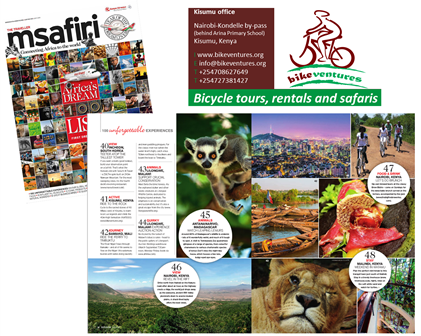 Bikeventures has been featured in the inflight magazine of Kenya Airways, partner of KLM #KQ #msafiri. So proud! For 2015 we are looking for a volunteer in Kenya to support Bikeventures in her further developments. The volunteer needs to have experience in organising and/or managing bicycle tours and rentals. Did you always want to volunteer abroad and cycling is your thing please have a look at the full volunteer description. No Comments to "Bikeventures featured in Msafiri"